Job is a perplexing book. Ask someone the story of Job and the chances are they’ll have the basic structure down, but having 42 chapters seems a little unnecessary, right? And aren’t there dinosaurs in there? And isn’t it weird that God allows Satan to do whatever he wants to Job? Isn’t that unfair? And why is it so long? I’m often drawn to study the more mysterious biblical books, probably because those are ones that I need the most help making sense of! 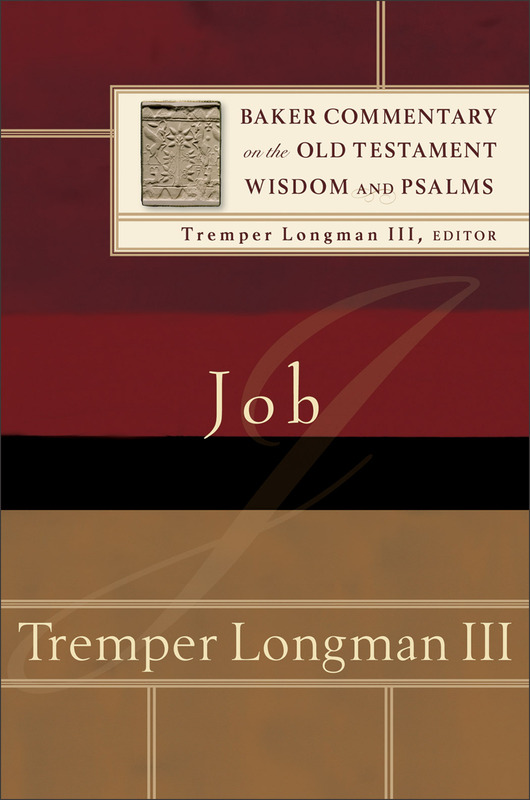 It’s for this reason that I was delighted to read Tremper Longman III’s Job commentary in the Baker Commentary on the Old Testament Wisdom and Psalms series. I very much enjoyed this commentary, though I will offer a few criticisms below. In regard to the positives, I will simply list the aspects I appreciated since they are diverse. A brief introduction (50 pages) that didn’t feel lacking. Longman covered authorship, language/translation, genre, historicity, structure, theology and history of interpretation. I most appreciated that Longman had two sections on Job in light of Jesus. We need more OT commentaries that are unafraid of mentioning Jesus! I was also very glad that speculative compositional theories were not given much attention here! Whatever form it may have taken in the past, Longman interprets the text we have before us now. Longman isn’t afraid of reading Job canonically, that is, in light of the rest of the OT (and at times NT) canon. Most often other wisdom literature books are brought into the commentary (Psalms, Proverbs, Ecclesiastes), but sometimes connections are made elsewhere also. Longman’s style is very readable, gentle, and pastoral without avoiding academic issues and discussions. Somehow he manages to succinctly address an issue without it feeling like too much or two little. Longman doesn’t neglect pastoral concerns in favour of interpretative ones; both are given adequate attention. On that note, scattered throughout the text are probably the most unique contributions of this commentary series: smaller contemplations called Theological Implications (44 in total). These highlight a particular thought from the preceding text and address it from a pastoral, canonical, and theological angle. These are extremely helpful for teaching and devotional contexts, as they help one consider a smaller detail at length, or maybe draw something to attention that is easily overlooked. These sections serve as great examples for how to teach Wisdom Literature, as launching pads for further theological reflection, or even a good topic for group discussion. It is here that Longman brings Christ into the picture the most. Longman brings a lot of ANE (Ancient Near East) issues to bear, often aiding him with interpretation. I was unaware of the many references to mythological beasts and/or pagan deities referenced in the text of Job. This new commentary (2012) reaps the benefit of recent studies in ANE literature and background. Though some will not appreciate this (and I didn’t at times, see below), Longman is careful in his interpretation and refrains from making bold conclusions, even when he would accord with conservative viewpoints. For example, Longman does not jump very quickly to Christ in some of the more suggestive and traditionally Messianic verses (e.g. Job 19:25). On the whole, this was welcome, as he tried to let the text speak for itself. Now for my few criticisms. At the beginning of each section Longman provides his own translation of the text. Considering that Job is such a long book, these translations can take up a few pages. As a random example the translation of Job 6:1-7:21 takes up 4.5 pages. This is understandable, but what I found tedious was that each smaller chunk of interpretation begins with a repetition of the translation for that section. So while we have the translation of 6:1-7:21 at the beginning, we also have each bit repeated at Job 6:1-4, 8-10, 11-13, 14-23, 24-30, 7:1-10, 11-16, and 17-21. I need not explain how repetitive this gets in the later sections like Elihu and Yahweh’s speeches. This isn’t annoying so much as it feels like a waste of space; I can’t help but wonder how much smaller this commentary would be if all the translation was taken out! On a more important matter, I found Longman a little dismissive of more traditional interpretations at times. I’ll give the three examples I have in mind. On the identity of “the satan/accuser” in Job: “While many translations give the impression that ‘the accuser’ is Satan, known as ‘the devil’ in the NT, it is best to understand this creature as a member of God’s assembly” (p52). Now, I understand and appreciate that Longman wants to interpret Job on its own right in the OT context and not attribute later ideas to earlier books by requiring the writer and readers of Job to understand Satan as we do. Perhaps “the accuser” wasn’t even identified with the Gen 3 serpent until later, so it’s fair we don’t assume too much. However, Longman seems to go even farther than this by stating that, even in light of NT revelation, we shouldn’t see this character as Satan. I’m not sure how this squares with Revelation 12:9, which clearly ties together the satan, the devil, the dragon and the serpent as all the same character. I’m not sure why this must be an either/or, can’t Satan play a role in God’s council, as other evil beings also appear to in Psalm 82. I know that Elihu is a divisive character for interpreters. Some see him much like John the Baptist preparing the way for the LORD’s speeches, others portray him as an arrogant young man, and the rest put him somewhere in the middle. I won’t criticize Longman for thinking that Elihu “says nothing new” (p367), as that is a valid viewpoint, but I do think Longman is a little unfair on him and provides more insults than evidence! Longman does support some of his claims, but as I said, seems to assert Elihu’s worthlessness more than proving it. Let me give a few examples of Longman’s rhetoric towards Elihu: “a false kind of spirituality” (368), “verbose” and “narcissistic” (p369), “pretentious” (p381, again p382), “self-center[ed]“ (p382), “one gets the impression of an excitable, overconfident, and self-centered young man” (p384), “rather pompous” (p385), an “annoying young man” (p385). He also agrees with Cheney who calls Elihu a “bafoon” (p370). This is all from chapters 32 and 33, we still have four more to go! Now, again, my criticism is not that Longman takes Elihu negatively, because that is a valid viewpoint. I just found the insults distracting; they didn’t persuade me to side with Longman, I just felt bad for Elihu! Lastly, I was disappointed with Longman’s reasoning for why the Behemoth and Leviathan were not dinosaurs. Again, I know it is common to reject this idea, but my problem is Longman’s basis for doing so. He rightly dismisses the idea that they are normal creatures such as elephant or crocodile, but says that believing them to be dinosaurs is “preposterous” because “the author of Job would have no knowledge of dinosaurs” (p441). And that’s that! This idea is not defended but asserted. I can only imagine that this is because Longman holds to a Christian version of the theory of evolution (see here), but many others don’t, so why so dismissive? I would have hoped for more basis than just assuming with the evolutionary system that dinosaurs existed long before humans. Considering how popular Young Earth Creationism is, I think Longman could have been more patient here since many YECs will no doubt make up his audience. Getting back on track, I greatly enjoyed Longman’s commentary. Job filled a niche role in my Job studies as it was both devotional and academic, pastoral and exegetical. I had not yet read a commentary on Job that stands so naturally in the middle between two extremes. Believe it or not, I actually read Job in my morning Bible reading over a period of a few months and read Longman’s Job commentary alongside it. This was a very helpful and devotional experience for me and would highly recommend others doing so! I would certainly recommend Job to pastors, teachers and students for better understanding Job, for devotional purposes, and for teaching. Many thanks to Baker Academic for providing a copy of this book in return for an unbiased review.